The movie is quite good, perhaps less surprising than Aardman previous entries, but the kids loved it anyway. 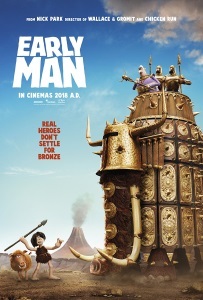 For some reason, the advertising about the movie seems to obfuscate that Early Man is really a football (soccer) movie with cavemen, and uses underdogs sports movie tropes the way Chicken run used POW movies tropes. The "man" in the title is a pun on Manchester United and there's a bunch of (spoilers) football easter eggs. I just saw this and it was fun to see during World Cup season. And yeah it's totally a football/soccer movie which is AOK. I enjoyed getting to see a wider range of Aardman characters than just the usual fusty British types you see in Wallace And Grommit.